August in Iowa can be quickly summed up in one word…hot! July has just passed by and the average temps have been hovering around the mid 80’s, August continues the trend with Mother Nature throwing in some 90 degree days, as well as a few century mark days just to let us know who is boss. By now surface water temperatures on area lakes have reached 75 – 80 degrees or more! The short answer, yes. So the question then becomes, how do we target and catch dog day fish…sun beaming down and sweat rolling down your back fishing. 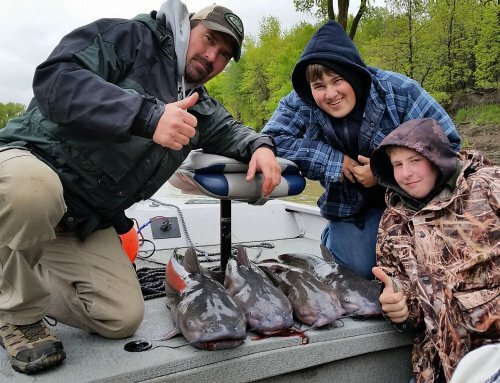 Well we’re going to figure that out, break down three of the most sought after fish in Iowa; largemouth bass, walleye and crappie, and give you some tools to add to your fishing arsenal. Okay, so let’s talk about some of the things that will influence where the fish are and where they are not. Like any living organism, those that inhabit lakes, rivers and streams, they need oxygen to survive. As water moves past their gills, microscopic bubbles of oxygen gas in the water called dissolved oxygen (DO) are transferred from the water to their blood. Warmer day’s heat up the water and DO becomes an important factor in finding the fish. As summer wears on three layers of water develop in Iowa lakes and reservoirs. The depth of these layers will depend on the depth of the lake. The top layer is called the epilimnion and gets the most sun and is the warmest of the three. The bottom layer is called hypolimnion, which is least affected by sun and is the coldest. The middle layer is called the thermocline, a thin but distinct layer in a body of water. The thermocline is of primary interest to fisherman due to the fact that this is where the highest levels of DO will be found. The warm water at the surface will have DO but not at comfortable concentrations for fish and the water at the bottom of the lake will be too cold and the DO levels there will be very low due the lack of sun and the decomposition that usually occurs at those depths. This is a key factor when it comes to chasing after dog day fish. If you keep that in mind as you spend time searching for active fish, you will be more successful than most. Some other factors that influence fish activity and location are weather and barometric pressure. The barometer actually plays a role throughout the year not just warm summer months. One of the most popular sport fish in Iowa is the largemouth bass. Anglers spend lots of time and money trying to figure out how to fool these feisty predators into taking their baits. Knowing that fish will more likely be concentrated deeper this time of year, we need to change our strategies accordingly. One of the best tools we have at our fingertips is a lake map that shows depth and structure. This goes for any fish we’re chasing during the summer. Good electronics are very helpful as well and many of the modern models are compatible with Lakemaster and Navionics lake map chips. Take time to look for deep creek channels, especially those that have bends and points in them. Bass will concentrate in these areas and follow break lines or channels from home areas to feeding stations. Some bass will suspend in and around 20 feet, but most bass will feed at about 10-20 foot of water and then move off to deeper water to rest. Crankbaits are great for searching for actively feeding fish. On depth finders if you find the baitfish you’ll find bass. Active bass tend to be those in groups of two or three. These bass are either holding close to the edge of the drop off or right off. They will wait and ambush prey as it swims by. Throw a deep diving crankbait up toward the shallow and run in out to the edge of the drop off. If you have some structure along the drop off, like stumps and logs, you can bounce your crankbait off these and entice bass to bite, even if they’re not actively feeding. Bass see something swimming right by that appears injured they’ll strike out of a reaction…easy meal. Jigs, creature baits and plastic worms can be very effective at these depths. These do very well when fish are relating to structure and holding tight to it. 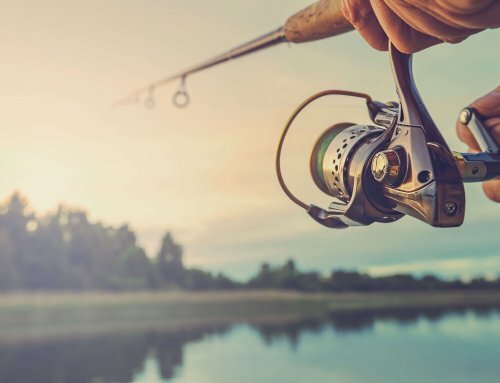 Keep your eye on your fishing line though as you move your bait through the water, more often than not the fish will pick up your bait on the drop and move off with it. Bass are not always found in deeper cooler water during the heat of the day, you’ll also find them shallow. When the sun is shining high in the sky and your standing in your boat, sweat dripping off your brow, you’re thinking to yourself, “man some shade would be really great right about now.” Bass or no different, they will be hiding in shady spots along docks and on the shady side of trees and stumps. I remember fishing one really hot afternoon out and away from the shoreline. As I pulled around a bend next to shore there was a large will tree hovering over the water creating plenty of shade. I knew there were a couple stumps out under that shade tree in about 10-foot of water, so I threw my 7-inch plastic worm up close and no sooner had it hit the bottom than a nice 3-lb bass picked it up. The difference was the shade and structure, something to hold the fish and a bit cooler water. Weed lines are also great for catching summer time fish. If you find a weed bed, look for small clumps of weeds that are off by themselves. These small irregular weed beds, little points or indentations and interior holes will draw most of the bass inhabiting the grass. Early in the day, buzzbaits, topwater baits such as a minnow or frog imitator work great. Once the sun comes up switch to jigs, tube baits or worms. So finding bass in the heat of day is not only possible, but also quality fish can be caught even when temps hit triple digits. Use your electronics, match your baits to the forage in the lake and don’t be afraid to move around. When you land that trophy bass, take some photos and get it back in the water as quickly as possible. Then pick up your phone and shoot a picture to your buddies watching fishing shows in the cool air conditioning…they won’t wonder any more if fish are biting now will they? Anglers across the state eagerly anticipate the spring bite for walleye knowing that as the water begins to heat up they’ll be more active and soon the spring feed will be on. You can find any number of fishing forums that talk about the great spring fishing but as spring turns to summer these conversations slow. Is it because the fish are just gone or they just don’t bite anymore? On the contrary, anglers are just not targeting walleye as much. Hot weather and warm water temps shy anglers away from chasing eyes. But just like bass, you can find quality fish even during the hot summer months. Walleyes are basically lazy fish. They don’t want to chase baitfish very far and are always looking for an easy meal. When baitfish suspend in the water column in the thermocline where DO levels are a bit better walleyes won’t be far off. Trolling deep diving crank baits is an excellent way to find active fish. Match your crankbaits to the fish forage in the lake. Typically here in Iowa you’ll find shad, small perch and bluegill. An alternative to using a deep diving crankbait is to tie on a three-way swivel rig. This is a great way to make a presentation with an Original Floating Rapala in size 7 or 9. This is a unique way to use a floating bait to match the forage in the lake your fishing, allowing you to troll at depths that otherwise could not be attained with a floating bait. This rig is not limited to just the Original Floating Rapala, you can tie on a jig/minnow combination, flutter spoon, any bait you’ve used for catching walleye. Another rig that is becoming increasingly popular and one that I’ve used with great success is called the “Slow Death” rig. Mustad® within the last several years released a new hook called Slow Death with a unique design that creates an enticing corkscrew presentation. Attach a bottom bouncer weight to your main line. Add a 4-5-foot leader, 10lb monofilament and attach the hook. Thread the crawler up the hook shank over the eye and then pinch it off about a half-inch behind the hook bend. Troll at slower speeds, the key is to keep the crawler spinning. I always check the rig for proper presentation by lowering it just below the surface of the water at trolling speed. If my crawler is rigged correctly I’ll get the corkscrew presentation I want. Add 1 ounce of weight for every 10 foot of depth you want to cover. If trolling doesn’t produce then try vertical fishing with jigging spoons. If the fish are deep you can get these down quickly especially if you find active fish. Silver spoons that imitate shad are a great option, if you’re fishing deeper or on a cloudy day try using glow-in-the-dark models. Fishing in deeper water in the summer has its drawbacks. 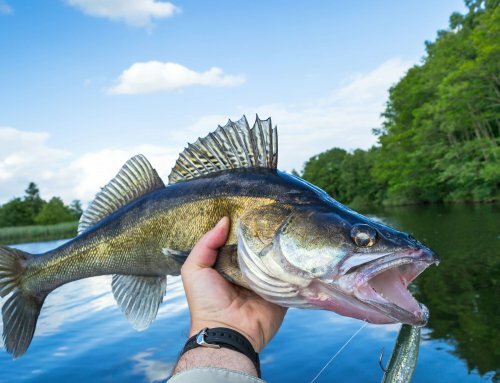 Veteran walleye fisherman will agree that most fish that are taken from really deep water will have a hard time surviving even if they are immediately released. When you take a fish from deep water it can’t adjust its airbladder to the change in air pressure. If you’re going to fish deep most fish will have to put in the livewell for dinner or they will just die and be wasted. This is especially true during the hot summer months. Check lake regulations for slot limits on walleyes here in Iowa, this could influence how deep you fish. Choosing the right tools for the job is important when taking on dog day walleyes. Electronics are incredibly helpful in locating schools of baitfish as well as active walleye. Crankbaits, bottom bouncers, jigging spoons and jigs are all part of the summer walleye arsenal and will help you put fish in your boat this month! One of the most popular pan fish in Iowa and like walleye, are frequently targeted during the springtime. They are shallow and readily take minnows or other baits offered under a bobber. Crappie fishing can be fast and furious, and for kids, the action will give them a few hours of thrilling fun. 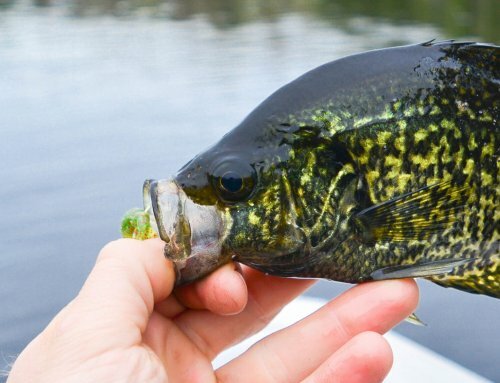 Crappies are great table fare and are a renewable resource. As the water temperatures begin to warm, these fish will move off shore to their deeper summertime haunts. Dissolved oxygen and the thermocline again are an important factor in successfully filling your livewell. 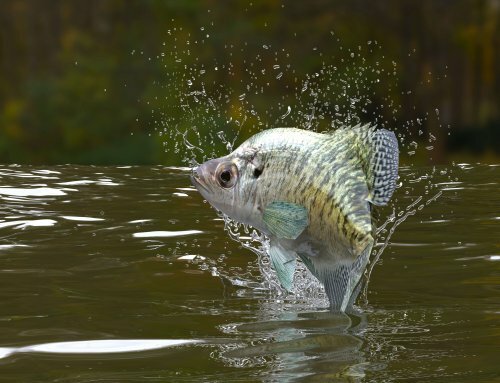 Lakes with incoming flowing water such as feeder creeks and streams will attract crappie as well as baitfish; these fish will tend to be shallower. Crappie will suspend off of deep creek and river channels. Look for standing timber, stumps and brush piles in about 20-30 feet. If they are actively feeding on a school a baitfish, drop a jig/minnow rig down using light line and a light jig. If you have a bit of wind, drifting through the area with this rig will produce for you as well but increase your weight to keep the bait in the strike zone. You can also use a two-jig rig, tying on a heavier jig for the bottom rig and the lighter of the two on the top. On the bottom jig thread a grub; chartreuse and black are one of my go to colors, and then the minnow on the upper jig. If you don’t want to use two jigs, then replace the upper jig with a minnow hook. Fishing for suspended summer time crappie can be maddeningly slow to bite. Changing the presentation such as speeding up if going through slow didn’t produce a bite, or maybe just dead sticking it right over the school will entice a few crappie to take your bait. Even a sudden change as you approach the school may get you a reaction bite. Can you still find these fish shallow? Sure, except during the heat of summer they will relate to structure and be tight to it. Standing timber is a great place to look for these fish in 10-foot of water or less. These are harder to cast to so use long “crappie” poles, 10-13 feet long. You can reach out from your boat or even from shore and drop your bait right alongside the structure. Fish the shady side or just outside of it, fish will suspend in the shade and ambush prey as it swims closely by. One note on using minnows – they will fade quickly on very hot days even if you do your best to keep them in the water as you drift. Surface temps can reach the upper 80’s at times and as we’ve mentioned before there is just not enough oxygen at those temps to keep minnows alive and happy. As an alternative to the traditional minnow bucket invest in an insulated bucket with an attached aerator. So there you have it…tools, strategies and systems that you can use to chase after your preferred quarry. Whether your fishing for bass, walleye or crappie the key to success is to adjust to the conditions you’re given to fish. Many professional anglers have said in interviews of their success that conditions changed and they adjusted accordingly. Make your adjustments and you’ll be a successful dog day angler…Tight lines!